As you may expect we need to first create our stored procedure that will handle the updating of our task data. In the same process as we previously did, go to your tasks table and right click and then “Script Table as” then “UPDATE To” then “New Query Editor Window”. This gives us a good start, but obviously we need to update this code. One thing that I need to be sure I communicate is that “UPDATE” statements can do a lot of damage to your data if not coded correctly. The crucial part of the update statement is the “WHERE” portion of it. The WHERE statement tells SQL exactly which rows/columns you want to update. If you do not specify a WHERE statement then SQL will go and instantly update every record in your database with data you didn’t intend for it to and the worst part is that there is no undo. For example, take the stub code that SQL just created for us. If you remove the WHERE clause then whatever values you told SQL to update with… it would update every single record in the Tasks table with the same value. Once you update records, even if it’s a million records, they’re updated and there’s not much going back unless restore a database backup. So, if you find yourself coding UPDATE statements… be sure to have the WHERE portion in place before you ever click execute. Looking at this code we again see the prefixed stored procedure name of “CBP_UpdateTask”. Again, you will put your own unique prefix and this helps avoiding clashes. After the name we define our parameters and you notice that we’re not accepting a UserID or ModuleID here in the update statement. A user can’t really change their UserID nor can they change the ModuleID so I purposely left those out. We’ll see if that comes back to haunt us later. Then we specify this as type “UPDATE” followed by the table name we want to update. In this case we want to update the CBP_Tasks table. Yours will be named whatever your table name is of course. Then we see the SET command and here is where we are updating values. We set the column data to the value of the parameter we are passing in. Finally you see the ever important WHERE statement. In the WHERE statement we instruct SQL to only update the row where the TaskID value is the same as the value of the TaskID parameter we’re passing in. For repetition… if we did not include the WHERE statement we would update every row with whatever data we pass in, which makes for not fun times. As always, we’ll then go and execute this stored procedure to ensure that it works properly. First right click on the database and refresh it. Then expand the Tables node and find your table. Right click and “Select top 1000 Rows” because we want to be able to verify if this update worked here in a few seconds. Then expand the Programmability > Stored Procedures and see if you see your “UpdateTask” stored procedure. Right click on your update stored procedure and “Execute Stored Procedure”. Here again we are presented with the pop-up that is looking for our sample parameters. Enter some parameters here… make sure that you enter a TaskID that is currently present in your table… and then click Ok. If all went well then you should have successfully updated a record in your table. Now with our stored procedure created we need to update it with the DNN specific syntax for inclusion in our SQLDataProvider files. Recall that the DNN specific syntax checks to see if the stored procedure exists and if it does then it drops it and instantly re-creates it. The script also replaces the .dbo with the DNN specific databaseOwner and objectQualifier values. Looking at this code you can again see the “Public Void” and the void is because we’re not returning any rows of data. Then we give the function a name “UpdateTask” and pass in a task object named “task”. Again, we set the taskId equal to an instance of our data provider and we utilize the ExecuteScalar sql method and pass in the string of the name of our stored procedure. In this case the “UpdateTask” followed by all the parameters that the Update stored procedure expects. And that’s all we have to do to update our TaskController class. On to the web service! In our web service we need to add a method for updating tasks. This route will be the URL that we will reach out to whenever we want to update tasks. Paste the following code into your web service file just below the “AddTask” method. Investigating this code it’s very similar to our previous code of our “AddTask” method. 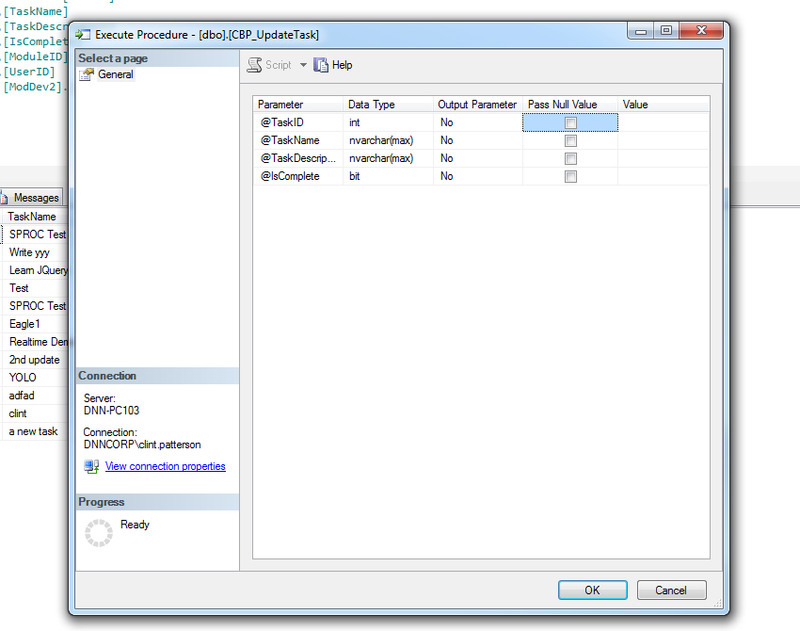 This time we create a class for the TaskToUpdateDTO (data transfer object). What is this object? It’s the object that will hold the values we get from our View.ascx file before we create a new task object and populate it with these values. Then again we have the DNNModuleAuthorize attribute and we’ve set it to view permissions. Again this means that anyone who has access to see this module will be able to call this function. I’m leaving the permissions a little loose for this series, you can update them as you like. Next we have the ValidateAntiForgeryToken because this is a POST request and we should always have that attribute on post requests. This helps protect us from being hacked by CSRF attacks (as mentioned in the previous blog). Finally we see the type of request indicated and as we mentioned this is a POST request. Then inside of our try block we create a new task object based on our task class definition and populate its properties with the values that are in our TaskToUpdate Data Transfer Object. Once populated we create a new TaskController named “tc” and then we call the UpdateTask method that we just created in our controller class. Into that method we pass in the task object that we’ve just populated. And we end with the catch block and log any exceptions that may have occurred. If you are a front-end developer with strong Angular or Knockout skills then the following section will probably drive you crazy as some of the functionality could be more easily achieved using Angular or Knockout. However, in hopes of not adding another layer of complexity (or something else to learn) I’m doing it all in jQuery. In the future I may return back and update the series with an Angular update. //Find the current task's isComplete value and store it as a variable. If it's checked it will return "true" if not then it will return "false"
Now that is a lot of code to paste in right… instead of trying to explain it all here in text, I’m going to explain it all in the video below. So check out the video to get the details and hopefully it will save me some time typing and you some time reading. So we’re almost done with the series, but we have 2 more items to cover… what if you want to delete a task from the task list? We’re going to cover that in the next blog. Hope to see you there. -You can repeatedly click he Edit button on a row which appends more and more Save and Cancel buttons. -You can edit multiple rows at a time and then if you click cancel on a row, all edits are cancelled and you are left with orphaned Cancel buttons. My comments are similar to the user above except that I have allowed one row of tasks to be edited at a time. I've noticed that the more you click the EDIT link the more the CANCEL and SAVE link appear. I have provided the user the ability to edit one TASK or Row at a time. The other EDIT links will be disabled until you've clicked the CANCEL or SAVE button. I have pasted the code down below. // Check the length of input box on the screen. If length greater than zero, edit input box is on screen. Great tutorial by the way. I'm learning so much. This has been the longest page so far.